StarMetro headlines today. Click here to read more. I almost choked on my tuna sandwich this morning when I saw this headline. That was just for starters. My eyeballs nearly popped out when I read the report. 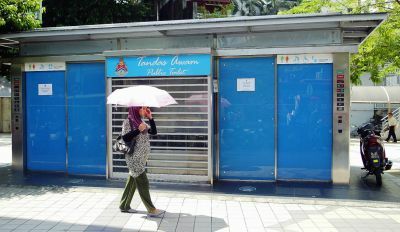 RM400,000 for a public toilet! That sum can buy a young adult a dream house under the MY FIRST HOME scheme. An Automated Street Toilet at a launching ceremony in 2006. RM4000 toilet than a RM400,000 one. That's taxpayers' money truly gone down the loo. I remember the fanfare that went with the launching of these toilets in 2006. I remember too thinking at the time that it wouldn't be long before one by one these toilets would break down and eventually become public eyesores. Well, my fears have come true in just a short span of barely six years. 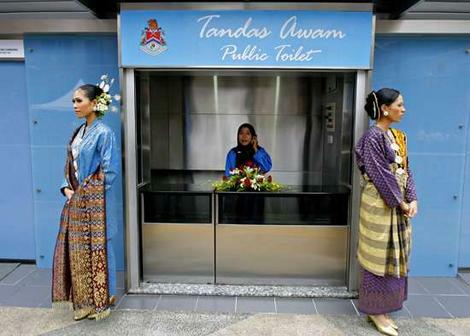 What boogles the mind is that each of these Automated Street Toilets (AST) costs a whopping RM400,000. There are 20 of them scattered around the city. That makes a total of RM8 million spent on providing a convenient place for people to pee! Guess who uses these ASTs most? Foreign workers and labourers. It gets even better. These ASTs are supposed to be high-tech. "The doors are very sensitive," says a spokesman from City Hall's building maintenance department. Probably true. I've seen a foreign labourer banging and kicking the door of an AST in the Kota Raya area in a vain attempt to get it open. My question is - why go for state-of-the-art toilets when most folks here don't even know how to use the low-tech toilets we currently have in public places? Something stinks here, and it's not just coming from these toilets. No one will be surprised if these ASTs end up in the next Auditor-General's report. I was downtown today with my camera. I managed to capture more examples of shoddy maintenance. This wheelchair lift at KLCC seems to be either under utilised or permanently under repair. Why? Jalan Sultan in Chinatown after a heavy downpour this afternoon. The surrounding drains were all clogged. No wonder the area is flooded whenever there's heavy rain. TV screens with no pictures. Most of the buses are poorly maintained, with broken plastic seats and ticket machines that often break down. You wouldn't expect to see this at the food court in Mid-Valley, one of the city's premier shopping malls. Not only are both taps not working, the sink doors are held together with cellophane tape! Potential danger. Exposed cables along Jalan Ampang. There's a world of difference between somebody whose main motivation is to do a good job - and somebody who just wants to make a quick buck. The former is what defines a useful and admirable human being; the latter is no better than a useless parasite. Malaysia desperately needs a heavy-duty prescription of deworming medicine! to add to your list: was at the kelana jaya immigration dept in jan. its so-called state-of-the-art passport machine also rosak. there was only one machine that could be used. it was manned by TWO officers, one to collect n change ur ringgit notes to 100 denomination (to 'speed up' the process, the other to key in for the applicant. is that how the be end govt creates jobs? over at KLIA, hv u noticed how some toilets also rosak? in malaysia, lots of public facilities seem rosak: lifts, escalators, taps, lights. these are at vital places such as public hospitals. of cos, in the private sector, it's common to be told computer/system rosak at banks, or the air pump at petrol kiosks rosak. the whole system is going rosak, from education, legal, to health and security. Viv, the list of rosak public facilities is endless. Some parties out there are probably making obscene piles of money by quoting enormous sums to provide inferior equipment e.g. plastic cisterns in toilets and plastic bus seats for heavy duty usage. As a frequent user of the public transport system, I've lost count of the number of times they have 'upgraded' the ticket machines. It gives me heartburn just to think about how much of the rakyat's money has been wasted. To pee, or not to pee, that is the question: Even if they charge RM5 for a pee will take endless years to cover back RM400k..haiz no eye see at their current condition. RM400k on jip's daughter's wedding !? (b) RM2.50 a loaf of Massimo + sky-juice !!?? BETTER save the miserable 50sen for my poor wife's piggy-bank !! With this sort of maintenance culture, this country MUST never allow any polluting industries like rare earth factories, nuclear facilities etc. That's why Malaysians must object vehemently against such industries from ever taking a toe hold here. Otherwise, we are dead ducks!!! However, with a Federal government like ours, we are already dead ducks!!! !